Vera Hanson born in 1925 recounts her lifetime memories. Born at Westwood, one of the younger Hanson children, she grew up later at Jubilee. It all starts with memories of her parents, Arthur Hanson & Mary Redgate. Arthur was one of five Hanson brothers who served in WW1. He was a regular before the Great War, was wounded and came out with chest problems. Work was hard to find and the family were poor but none of that held them back as there were always lovely home made meals cooked by her mother, freshly baked bread and savoury ducks from the Newbolds. Vera tells of sledging down Pye Hill on home made wooden sledges in the great winter freeze of ’47 , buying clothes from Mrs Foulds second hand store, of Fred Fido on piano in the local pub and Vera’s first and absolute last gin and tonic. Add to that, McSally’s chip school lunches and Mr Stringfellow, head of Jacksdale School in his jacket and spats. 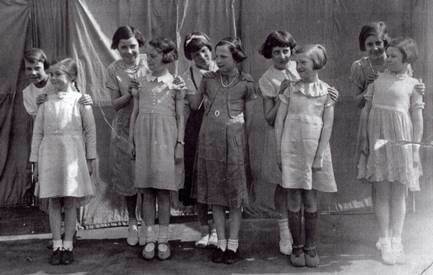 The photo is of Jacksdale School girls in 1934 at which time Vera would have been aged 9, we have no names but I am just hoping Vera or her best friend Peggy Fido may be in it.